Today’s update discusses rural broadband issues and federal regulatory action that was taken this month to help close the digital divide in Rural America. The update also touches on a couple of legislative proposals regarding broadband expansion, and highlights a recent USDA survey that documents how many farmers are using the Internet and how they are currently connecting. 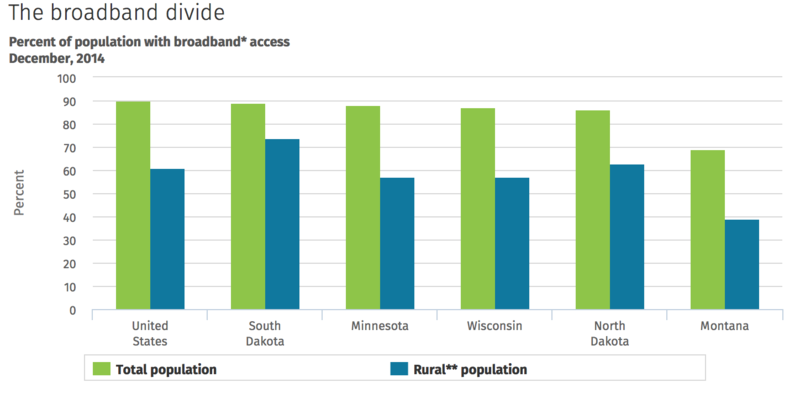 Recall that back in June, The Wall Street Journal published a detailed report on the availability of high speed Internet access in rural America. The article, “Moving at the Speed of Dial-Up,” stated that, “In many rural communities, where available broadband speed and capacity barely surpass old-fashioned dial-up connections, residents sacrifice not only their online pastimes but also chances at a better living. In a generation, the travails of small-town America have overtaken the ills of the city, and this technology disconnect is both a cause and a symptom. More recently, USA Today writer Sari Lesk reported this month that, “Local farmers, students and broadband industry leaders on [August 4th] asked federal officials to boost rural access to quality broadband in a local listening session with the federal Agriculture Secretary. “Farmer Leslie Svacina said in the session that even basic business functions are difficult without reliable high-speed internet access. The article noted that, “U.S. Department of Agriculture Secretary Sonny Perdue said addressing that issue is one of the keys to improving rural prosperity. ‘Broadband connectivity today is that water and sewer of the 20th century, and it’s become a necessity,’ he said. Perdue said the issue affects a variety of areas including business and education. Meanwhile, an article last week at The Fedgazette (Federal Reserve Bank of Minneapolis- “Border-to-Border Dreams“) explained that, “Alternatives to wireline broadband often deliver lower speeds or are more expensive. Fixed wireless networks require transmission towers as well as fiber connections, and obstacles such as hills and trees can interfere with the signal, [Bill Coleman, a broadband consultant who has advised on projects all over Minnesota] said. Cell phone service is slow and coverage often spotty outside metro areas, while satellite links are pricey and vulnerable to weather disruptions. In 2014, access to high-speed internet service outside urbanized areas lagged overall access nationwide and in every district state, according to the latest available data from the Federal Communications Commission. “Border-to-Border dreams,” by Phil Davies and Ann Harrington. The Fed Gazette- Federal Reserve Bank of Minneapolis (August 15, 2017). Earlier this month, Wall Street Journal writer John D. McKinnon reported that, “Federal regulators took steps [on August 3rd] to close the digital divide in rural America, moving to reshape two subsidy programs that they say haven’t been as effective as needed. “Expanding access to broadband in hard-to-serve areas across the U.S. has proved a challenge for years, not only because of costs, but also because of the rapidly changing technology itself. The Journal article added that, “Sen. Roger Wicker (R., Miss.) said he expected the Trump administration to address the digital divide in rural areas in its long-awaited infrastructure proposal. “The FCC estimates that in urban areas, 97% of Americans have access to high-speed fixed service. But in rural areas it is 65%, and 60% on tribal lands,” the Journal article said. Meanwhile, a news release last week from Senate Ag Committee Member Kirsten Gillibrand (D., N.Y.) stated that, “[Sen. Gillibrand] and U.S. Senator Shelley Moore Capito (R-WV) announced the Broadband Connections for Rural Opportunities Program Act, also known as the B-CROP Act. This bipartisan bill would make grant funding available for rural broadband projects in high-need areas to be awarded in combination with the current loan funding available through USDA’s Rural Utilities Service. And earlier this year, a news release from House Ag Committee Member Tom O’Halleran (D., Ariz.) indicated that, “[Rep. O’Halleran] made a commitment to rural communities across the 1st District by cosponsoring the New Deal Rural Broadband Act, a bill to invest in broadband internet infrastructure across the country. In a more narrow look at current Internet use among U.S. farmers and how they are connecting to the Internet, late last week, the USDA’s National Agricultural Statistics Service (NASS) released its Farm Computer Usage and Ownership report, which is published every other year. In part, Friday’s report stated that, “In 2017, USDA-NASS added two additional methods that farmers could select for accessing the Internet. Fiber-optic and mobile Internet service for a cell phone or other device are the two access methods added to the Farm Computer Usage and Ownership report. Fiber-optic was used by 8 percent of the farms, and mobile Internet service was used by 17 percent. However, DSL (Digital Subscriber Line) connection continues to be the most common method of accessing the Internet, with 29 percent of the farms in the United States using it, down from 30 percent in 2015. A satellite connection, at 21 percent, remained steady from 2015. Other reported methods of accessing the Internet include cable modem service, dialup service, and other or don’t know. Cable modem service is at 15 percent, up 3 percentage points from 2015. Dialup service is at 2 percent, down 1 percentage point from 2015. The report indicated that 71 percent of farms in the Unites States have Internet access, while in Illinois, that percentage increases to 78 percent. Farms with Internet Access. (Farm Computer Usage and Ownership, USDA, National Agricultural Statistics Service (August 2017)). The NASS report showed that farms in the western part of the United States had a relatively larger percent of farms accessing the Internet than other geographic regions. 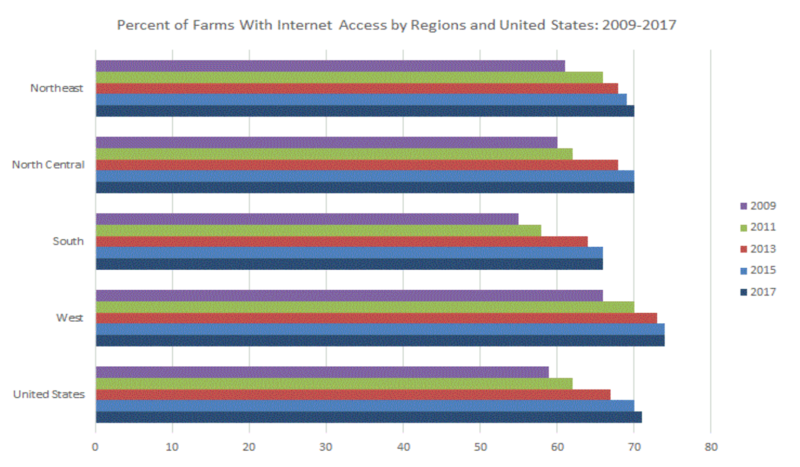 Percent of Farms with Internet Access by Regions and United States, 2009-2017. (Farm Computer Usage and Ownership, USDA, National Agricultural Statistics Service (August 2017)). In a closer look at how Illinois farms connect to the Internet, the NASS report included the following tables demonstrating that in 2017: two percent of farms connect with dialup, 26 percent with DSL, 11 percent with cable, five percent with fiber optic, 16 percent mobile, and 32 percent with satellite (the remaining 8 percent of farms were other/unknown). Primary Method of Internet Access- Dialup, DSL and Cable (Farm Computer Usage and Ownership, USDA, National Agricultural Statistics Service (August 2017)). Primary Method of Internet Access- Fiber optic, Mobile and Satellite (Farm Computer Usage and Ownership, USDA, National Agricultural Statistics Service (August 2017)).